March is staring me down, dear colleagues. That long, long month with not a single day off. My classroom routines are long-established, I know my middle school students inside and out…but the end of the year is not in sight. Not at all. This period, between winter and spring breaks, represents our last long, sustained chunk of serious learning before state testing, warm weather, field trips, and general exhaustion overtake us. I find that I need glimmers of hope in March. Proof that we have accomplished something this year. Too often I am distracted by my students’ seemingly endless absences, missing work, or speaking of English (really? still?!). 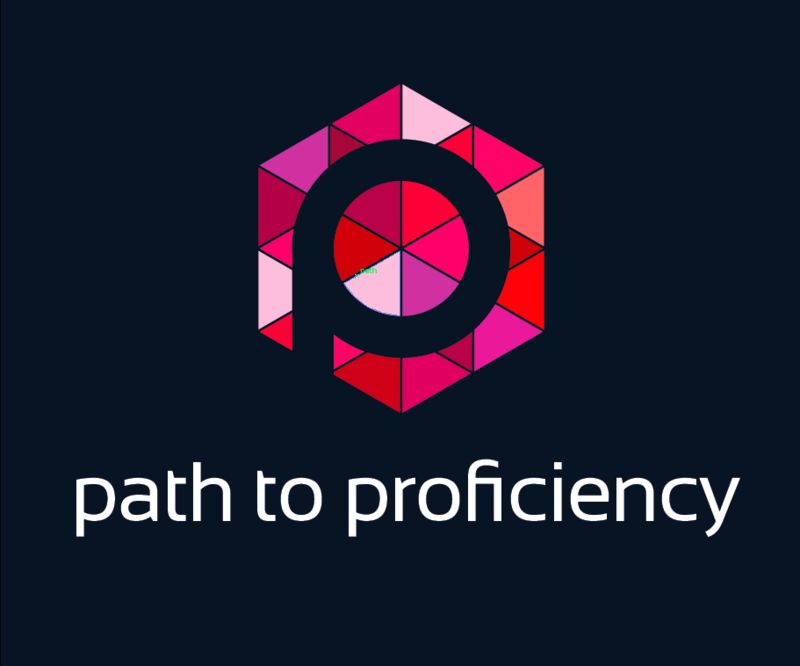 I ask myself, are we getting anywhere on this path to proficiency? Sometimes I’m so deep in the weeds that I can’t seem to zoom out and see the big picture. Students need a bit of a boost, too. And what better boost than seeing evidence that they are really learning and making true progress? When students are getting back assignment after assignment marked Intermediate Low, they may not realize how far they’ve come. Each sublevel takes time to master, and that incremental growth can be too hidden for impatient, young minds to appreciate. I was able to provide a “zoom out” experience in my French 8 classes recently, and to thereby show students how far they’ve come. I was returning a recent summative presentational writing assessment. While students’ performances were really strong in many respects, most students earned yet another Intermediate Low or B grade. Meeting the standard doesn’t sound very glamorous to my students, and they aren’t too excited to be earning Bs, either. Read this post about how my department rewrote its rubric and opted to set B as the grade for meeting the proficiency target, if you want to know more. I even had one of my more sarcastic boys joke, “Madame, you should make reward stickers for us that say, ‘I met the standard!’” Insert eye roll here. Right after I returned the assessments, however, I also handed back copies of a paragraph-length assignment that students wrote in early September (which I’d somehow had the forethought to photocopy as evidence – their own original copies are long-lost, I’m sure!). Students began to gasp and yelp as they saw what their writing looked like back in September. They were horrified. While it wasn’t my intent to shock them or make them feel bad about where they’d been (after all, their Novice High proficiency back in September was hard-won and reflected an entire year of learning in French 7), it was clear that students were very, very impressed by how far they’d come. No matter where they’d begun in September, nor where they were now months later, everyone was moving in the right direction. This was a powerful and inspiring reminder to all of us, and perhaps most especially to me! I then asked students to reflect on their progress in their journals with the prompt, “When I compare the paragraphs, I notice….” For the one or two years that I have my students, we use exam books as journals for private, student-teacher, English-language communication: mostly a lot of student reflection, feedback, and goal-setting with brief bursts of enthusiasm (Yes! Bravo! ), encouragement (Go for it! You can do it) and questioning (Why do you feel this way? How can I help you reach that goal?) from me. These reflections not only tell me that my students feel they’re making progress, and can point to specific evidence as proof, but also that they know what progress means in this course. They are using their own definitions of proficiency to measure their success. Once students had done the work of looking back, I wanted to make sure that their reflections would yield some productive “feedforward.” There’s a great “Cult of Pedagogy” podcast on this topic if you want to know more about this term. Basically, it boils down to focusing on taking future actions more than fretting about the past. Feedforward can include teachers providing suggestions for next steps in order to foster student growth. I projected a list of my most frequent suggestions from that latest writing assessment and told students that they’d likely recognize a few of these suggestions on their own work. Then, I gave each student a sticky note and asked them to write themselves a few suggestions for their next writing assignment. My plan is for students to physically place this sticky note on the top of the next assignment they do and refer to it explicitly as they work. 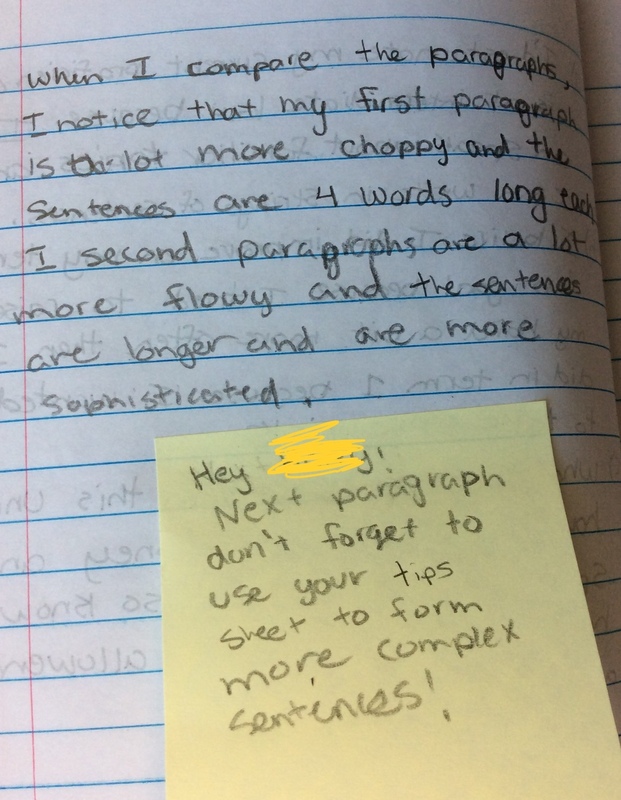 Students wrote excellent advice for themselves, such as: “Hey… Next paragraph, don’t forget to use your tips sheet to form more complex sentences” and “Use transition words! Is there enough detail? DIVE RIGHT IT! No fragments! Avoid English.” While most of their advice was a direct repeat of what I’d suggested, I’m hoping that the format will make it more likely that they remember what they need to work on, and are able to incorporate those suggestions into forthcoming tasks. In this way, my comments and their sticky notes will together serve as feedforward to promote even further growth. And that’s what we all need to be thinking about at this time of year when there’s still important learning ahead of us for months to come. I LOVE the idea of using sticky notes to have the students reference on the next assignment. We keep portfolios of their work, and they are constantly comparing past work and doing self evaluations. We talk a lot about how to move to the next level, but I have been looking for something more concrete like this! Thank you!! !